Ghouls, drinking human adult beverages? Not on your life! Come this Halloween, slap a few of these Glowing Halloween Slapsticker Beer Bottle Labels on your bottles and serve them to discerning ghouls who will appreciate such a clever beverage brand. Each pack of labels is sold as a set of 12, which ensures that you get 3 of each clever label. You will get labels for Franken Stout, pioneered by Victor Frankenstein and designed to shock the system and release the monster. You will get labels for classic Bloodweiser. You will get labels for Coroner Extra, which is best served chilled. And lastly, you will get labels for Cursed Night. And best yet, each of these labels are designed to glow, both in the dark and when exposed to a blacklight. Each label comes as a sticker so it can be easily applied to any standard sized beer bottle. 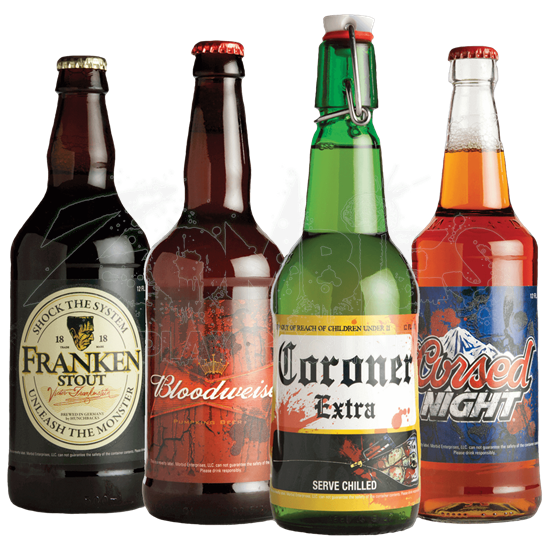 Apply a few of these Glowing Halloween Slapsticker Beer Bottle Labels to your drinks of choice and serve them to your guests, family, and friends on Halloween, when all the ghouls and guys are sure to appreciate a perfectly themed beverage.